Designed and built to exceed the needs of service-industry providers — landscapers, contractors, maintenance crews and suppliers — there's no doubt that Morgan's ProStake Platform body will be the BEST tool of your trade. 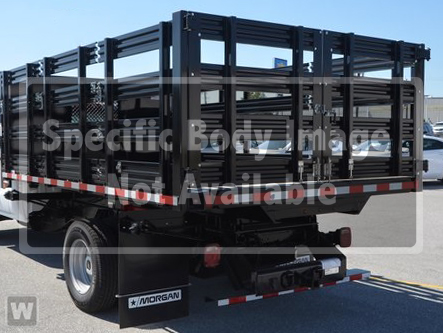 With bodies ranging from 9 to 16-feet, your choice of flatbed or rack configurations, and a wide range of optional and industry-specific features designed to make your job easier and more efficient — Morgan has what you need to do the job! Conscientious design features, such as the bulkhead punch window and cab extension, support safety; as do bulkhead gussets that are engineered to provide strength, durability and added protection for your cab, your cargo…and your crew. Morgan’s innovative swing rack design eliminates the need to lift and remove heavy gates in order to load or unload. Racks swing a full 270-degrees, and can be secured to the siderails for easy and unencumbered loading and unloading. Heavy-duty Solid Hardwood flooring is standard on all flatbed bodies, and offers natural shock absorption, weather and insect resistance. Standard three-inch I-beam frame construction adds superior strength and durability. And strategically positioned crossmembers (16-inches on center) add to that strength, while keeping weight to a minimum, for better fuel efficiency. A standard, heavy-duty rub-rail helps to protect the flatbed frame and side rail pockets from minor impacts. Deep pocket design provides solid seating of rail stakes; making it easy to secure your load during transport, and remove rails for loading and unloading. Pre-engineered 2" receiver tube design for hitch or pintle plate configurations, a variety of bumper options, the use of ready-to-use molded harness and sealed plug-together connectors, and "universal design" features, such as standard LED body clearance and ID lighting, make it EASY to spec or replace components quickly and efficiently. Choose from a variety of options, including cab extensions, stake racks in galvanized steel or black powder-coat, and hoists to help make loading and unloading fast and efficient. Morgan makes it easy to spec a body that meets your needs — without compromise.